WILLEMSTAD -- In the past two weeks, law firm VanEps Kunneman VanDoorne organized a moot court for law students of the University of Curaçao. With this moot court, the firm contributed to the celebration of the 35th anniversary of the University of Curaçao dr. Moises da Costa Gomez (UoC). 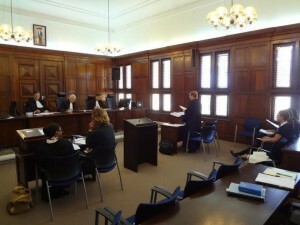 On Saturday May 17, the final round of the moot court took place at the Court. The participants were advanced students of the bachelor’s and master’s program of the Faculty of Law. The university as well as the participating students look back at the moot court with enthusiasm. VanEps Kunneman VanDoorne consequently considers organizing the moot court annually. Anticipating on that idea, enthusiastic students among the public already cried, “Next time we will definitely participate as well”. In addition, all participants considered the moot court to be particularly instructive. The moot court was kicked off on April 28 by providing the case the competition was focused on. The case described a fictitious litigation in which two parties compete about compensation after a purchased work of art appears to be forged. During two weeks, the students received more information on the case at different times, they could use the legal library of the law firm, and senior associate Rogier van den Heuvel trained them on how to plead a case. The students could show the result of their efforts on the day of the finals, which was last Saturday. Beside the case they had prepared, the participants also pleaded a second case they were given on the spot. The arguments were reviewed by a jury consisting of judge Peter van Schendel and partners Michiel Gorsira and Mayesi Hammoud of VanEps Kunneman VanDoorne. With two female winners, Madelon Bos and Melitza Willems, the victory of the moot court was a ladies’ affair.